Bouillon cubes are little gems of the cooking world. Similar to PeachDish, they provide phenomenal flavor conveniently packed and easy to use! 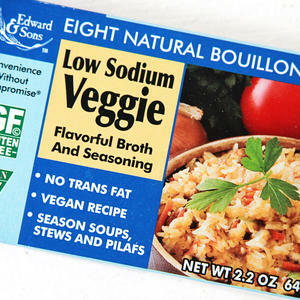 We prefer Edward and Sons bouillon cubes, in particular, for adding a punch of flavor to our dishes. "The flavor to saltiness ratio is really high," says Chef Seth Freedman. "Most bouillon have very distinct dried spice and faux savory qualities to them. Edward and Sons has nuch more fresh, herbal flavors because of the natural ingredients that go into their cubes."